The 4000 adds yet another compact, high power reel to the Salt lineup. 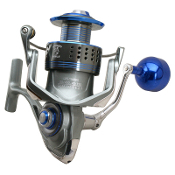 This spinning reel has a specially designed spool for long casting, and it can hold up to 450 yards of 30 lb braid. With 39 pounds of drag and a 6.2:1 gear ratio, this beauty is sure to give any fish a run for its money.